1st Interstellar "Comet "... Oumuamua? Well, that didn’t take long. Shortly after the announcement that the interstellar object, now named ‘Oumuamua, which visited our solar system last month was oddly cylindrical in shape, speculation arose on reddit and other places that it could have actually been a spaceship, possibly one traveling for millions of years and not necessarily occupied anymore. The above comment was from a reddit commentator Andromeda321 who was identified as an astronomer and it stimulated many interesting and well-thought-out comments on the possibility, as well as more than a few expressing incredulity. Also on reddit, Eyusmaximus brings up the possibility that “An interstellar ship could maybe possibly be using an Alcubierre drive” (a theoretical faster-than-light idea using negative mass) and others speculated that its shape resembles a booster drive discarded after usage. Over at Science Fiction & Fantasy Stack Exchange, someone compared the shape and spinning of ‘Oumuamua to that of Rama, the spaceship in Arthur C. Clarke’s sci-fi novel, Rendezvous with Rama, which was 50 km long by 16 km wide (31 by 10 miles – much bigger that the 400 meter long ‘Oumuamua) which had a 0.25 rpm spin to provide artificial gravity. On Twitter at #Oumuamua, AndersonatAberdeen‏ (@andersaberdeen) said “#Oumuamua rather reminds me of the probe from Star Trek IV The Voyage Home.” That’s the whale probe, which had a similar shape. An interesting comment by A.C. Charania (@ac_charania) refers to a paper he wrote in 2008 called “Dyson Asteroid Shells: Hollow Worlds from the Outside-In” which proposes creating “a human asteroid habitat” by “enclosing a small body such as an asteroid (potentially focused on rubble pile compositions) in a rigid or semi-rigid shell” he calls a “Dyson Asteroid Shell.” His drawings suggest a cylindrical shape might be better for space travel. Did some alien civilization beat him to it? Is this more plausible than Tabby’s star and the Dyson sphere? Unfortunately, our measly Earth rockets couldn’t catch up to ‘Oumuamua to do a landing, intercept or visual inspection. 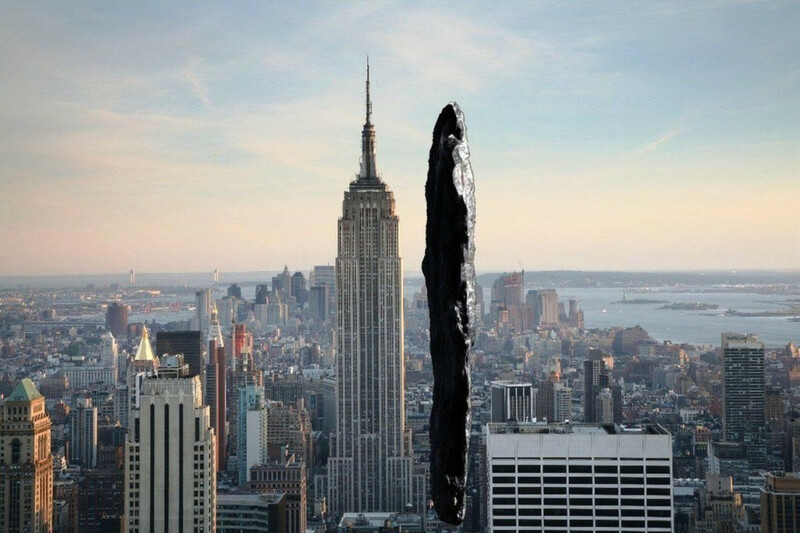 In fact, the main ‘visual’ we have of it so far is an artist’s rendition which makes it look like a long pointed rock. A conspiracy theorist might wonder if it was intentionally drawn that way to hide its real identity from the public. Will we ever know if ‘Oumuamua was a spaceship? Probably not. Our best bet, now that we know these oddly-shaped intergalactic asteroids exist, is to watch for more and get better pictures instead of relying on drawings. And, while ‘weird space rock’ is still leading in the polls, it’s always nice to have an opportunity to bring up Arthur C. Clarke and his fascinating and prescient novels. While we wait, what do YOU think ‘Oumuamua is? 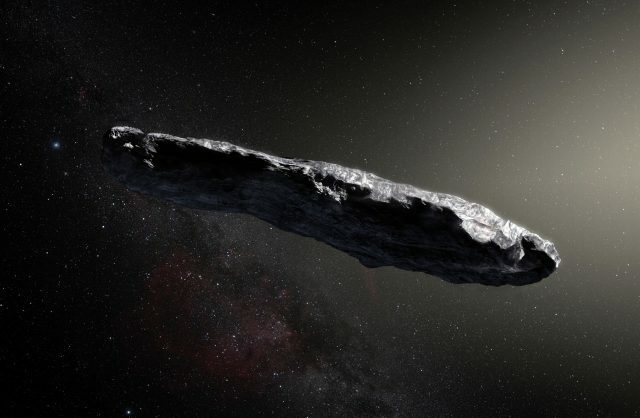 New data reveal that the interstellar asteroid that recently zipped through our solar system is rocky, cigar-shaped, and has a somewhat reddish hue. It’s the first confirmed object from another star observed in our solar system, and was discovered Oct. 19 by the University of Hawaii’s Pan-STARRS1 telescope team, funded by NASA’s Near-Earth Object Observations Program. The telescope team named it ‘Oumuamua (oh MOO-uh MOO-uh) – Hawaiian for “a messenger from afar arriving first.” The unusually-shaped asteroid, which is up to a quarter mile long and perhaps 10 times as long as it is wide, may provide new clues into how other solar systems formed. Also, Advanced Weather Satellite Launched, James Webb Space Telescope Completes Final Cryogenic Testing, Recurring Martian Streaks: Flowing Sand, Not Water? and Happy Thanksgiving, from Space! There’s no telling what ‘Oumuamua could be. Earlier this year, our solar system got a visitor the likes of which it has never seen. Astronomers first spotted the object on October 18th using the PanSTARRS 1 telescope in Maui. At first, the visitor appeared to be a the first known comet to originate from outside our solar system, but further observations revealed it to be much stranger. 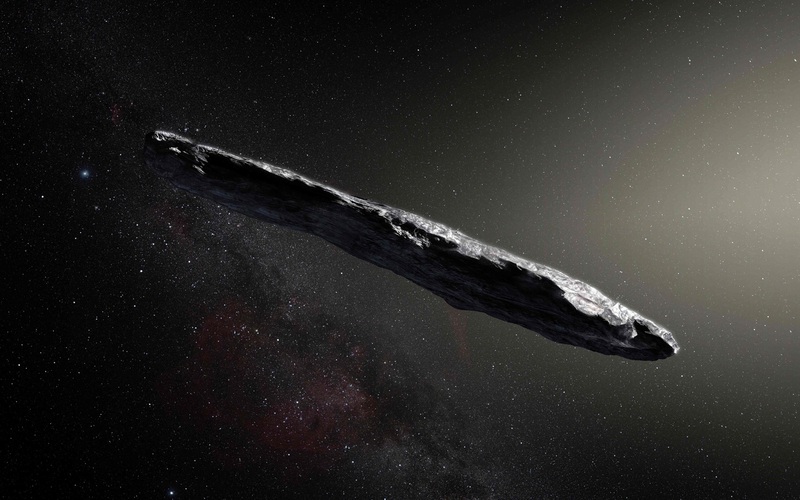 Nevertheless, it was clear that the speeding visitor came from interstellar space, so the object was given the name ‘Oumuamua from the Hawaiian meaning “a messenger from afar arriving first.” Further analysis by the European Southern Observatory found the object to be perhaps not quite a comet, not quite an asteroid, and cigar-shaped. Based on the light bouncing off of it (or lack thereof), astronomers estimate the object to be among the darkest objects ever observed in space, absorbing 96% of the light that touches its surface. Given the strange nature of the object, it wasn’t long before speculation ran wild that we might have just encountered our first extraterrestrial spacecraft. Avi Loeb, the chair of Harvard’s astronomy department, writes “the more I study this object, the more unusual it appears, making me wonder whether it might be an artificially made probe which was sent by an alien civilization.” In particular, scientists are struck by the long cylindrical shape of the object; ‘Oumuamua is estimated to be between 100 and 400 meters long with much smaller diameter. Such cylinder shapes are perfect for aerospace applications – just look at our own space shuttles and rockets – but are seldom seen in naturally occurring space objects like comets or asteroids which tend to be more spheroid. Even if the chances that ‘Oumuamua could be an alien craft are tiny, any possibility greater than 0% is exciting. Could this be it? Are we finally be close to getting a glimpse of a civilization far more advanced than our own? I sure hope so. If this festering dung heap of a civilization is the best the Universe has got, maybe it’s best that we’re all alone out here. Breakthrough Listen’s observations of ‘Oumuamua begin tomorrow at the Robert C. Byrd Green Bank Telescope in West Virginia. Fingers crossed. Ever since its discovery in mid-October as it passed by Earth already outbound from our solar system, the mysterious object dubbed ‘Oumuamua (Hawaiian for “first messenger”) has left scientists utterly perplexed. Zooming down almost perpendicularly inside Mercury’s orbit at tens of thousands of kilometers per hour—too fast for our star’s gravity to catch—‘Oumuamua appeared to have been dropped in on our solar system from some great interstellar height, picking up even more speed on a slingshot-like loop around the sun before soaring away for parts unknown. It is now already halfway to Jupiter, too far for a rendezvous mission and rapidly fading from the view of Earth’s most powerful telescopes. Astronomers scrambling to glimpse the fading object have revealed additional oddities. ‘Oumuamua was never seen to sprout a comet-like tail after getting close to the sun, hinting it is not a relatively fresh bit of icy flotsam from the outskirts of a nearby star system. This plus its deep red coloration—which mirrors that of some cosmic-ray-bombarded objects in our solar system—suggested that ‘Oumuamua could be an asteroid from another star. Yet those same observations also indicate ‘Oumuamua might be shaped rather like a needle, up to 800 meters long and only 80 wide, spinning every seven hours and 20 minutes. That would mean it is like no asteroid ever seen before, instead resembling the collision-minimizing form favored in many designs for notional interstellar probes. What’s more, it is twirling at a rate that could tear a loosely-bound rubble pile apart. Whatever ‘Oumuamua is, it appears to be quite solid—likely composed of rock, or even metal—seemingly tailor-made to weather long journeys between stars. So far there are few if any wholly satisfactory explanations as to how such an extremely elongated solid object could naturally form, let alone endure the forces of a natural high-speed ejection from a star system—a process thought to involve a wrenching encounter with a giant planet. So far limited observations of ‘Oumuamua, using facilities such as the SETI Institute’s Allen Telescope Array, have turned up nothing. But this Wednesday at 3 p.m. Eastern time, the Breakthrough Listen project will aim the West Virgina-based 100-meter Green Bank Telescope at ‘Oumuamua for 10 hours of observations in a wide range of radio frequencies, scanning the object across its entire rotation in search of any signals. Breakthrough Listen is part of billionaire Yuri Milner’s Breakthrough Initiatives program, a collection of lavishly-funded efforts aiming to uncover evidence of life elsewhere in the universe. Other projects include Breakthrough Starshot, which intends to develop and launch interstellar probes, as well as Breakthrough Watch, which would use large telescopes to study exoplanets for signs of life. “With our equipment at Green Bank, we can detect a signal the strength of a mobile phone coming out of this object,” Milner says. “We don’t want to be sensational in any way, and we are very realistic about the chances this is artificial, but because this is a unique situation we think mankind can afford 10 hours of observing time using the best equipment on the planet to check a low-probability hypothesis.” Besides being simply a search for signs of aliens, Breakthrough Listen’s efforts could also narrow down the possibilities for ‘Oumuamua’s composition by looking for signs of water vapor sublimating from any sun-warmed ice lurking beneath the object’s red, desiccated surface. Avi Loeb, an astrophysicist and Breakthrough advisor at Harvard University who helped persuade Milner to pursue the observations, is similarly pessimistic about prospects for uncovering aliens. There are, he says, arguments against its artificial origins. For one thing, its estimated spin rate seems too low to create useful amounts of “artificial gravity” for anything onboard. Furthermore, ‘Oumuamua shows no sign of moving due to rocketry or other technology, instead following an orbit shaped by the gravitational force of the sun. Its speed relative to the solar system (about 20 kilometers per second) also seems rather slow for any interstellar probe, which presumably would cruise at higher speeds for faster trips between stars. But that pace aligns perfectly with those of typical nearby stars—suggesting ‘Oumuamua might be merely a piece of galactic “driftwood” washed up by celestial currents. Several years ago Loeb and two colleagues performed a speculative calculation estimating the interstellar abundance of ‘Oumuamua-sized space rocks based on the density of stars in the Milky Way and the vagaries of planet formation. That calculation, Loeb says, suggests the number of such space rocks is at least a hundred thousand times too low to account for ‘Oumuamua’s detection. Simply put, objects like ‘Oumuamua should be far too rare for our current telescopes to have any reasonable chance of spotting one. Newer studies gauging the odds find that for ‘Oumuamua’s detection to not be an astronomically unlikely fluke, there must be a sizeable population of such objects continuously passing through our solar system. This in turn suggests that more-capable future observatories, such as the Large Synoptic Survey Telescope, will find many more when they begin operations in the 2020s. Either way, Siemion says, “‘Oumuamua’s presence within our solar system affords Breakthrough Listen an opportunity to reach unprecedented sensitivities to possible artificial transmitters and demonstrate our ability to track nearby, fast-moving objects. Whether this object turns out to be artificial or natural, it’s a great target. San Francisco – December 11, 2017 – Breakthrough Listen, the global astronomical program searching for evidence of civilizations beyond Earth, announced that it is currently focusing its observational efforts on ‘Oumuamua, the mysterious interloper recently spotted moving rapidly through the solar system. If it's an asteroid it won't have a tail or break up like comets do. It's just a big rock...maybe an iron/nickel rock like a meteorite. I wonder why the sun's gravity didn't capture it? Astrophysicist and 'Astrophysics for People in a Hurry' author Neil deGrasse Tyson explains the science behind the first observed interstellar object to visit our universe (which Stephen knows is full of aliens). "Nothing of interest in this star system. FULL SPEED AHEAD!" It’s a bird! It’s a plane! It’s an asteroid! It’s a weird spaceship from another galaxy! It’s a comet! It’s … Oumuamua! The interstellar visitor didn’t stay long but it has captivated the hearts and minds and computer models of astronomers and space scientists worldwide who want to know what it is. Researchers watching the trailing end of the cigar-shaped visitor as it left the solar system noticed that it was accelerating. While it could have just been trying to get away from the all of the chaos it saw on Earth, the real reason seemed to be that gas coming off of the back end was pushing it to a slightly higher speed … a trait that is commonly seen on … sorry, it’s too late to place your bets … comets! A team led by Marco Micheli, a European Space Agency astronomer, released their study this week in the journal Nature. The acceleration of Oumuamua was actually expected since it would be affected by the gravitational pulls of the Moon and outer planets, but the speed at which it was moving could not be attributed to gravity alone. Karen Meech, an astronomer at the University of Hawaii in Honolulu and a team member, explained to Hawaii’s KHON that the unusual lack of dust and ice on Oumuamua meant it didn’t have a tail and that initially led observers to think it was a rocky asteroid rather than an icy comet. In addition, Meech says astronomers were looking for evidence of cyanide, which gives comets a blue hue. They didn’t see it, which means that Oumuamua is still a comet but one with a different chemical composition that those passing thought the solar system before. If you’re looking for a career exploring the stars and you’re too tall or too scared to be an astronaut, Meech recommends astronomy as the job of the future. Exciting, yes … unless you’re the astronomer who spots the deadly asteroid or comet heading straight for Earth. On October 19th, 2017, the Paannamic Survey Telescope and Rapid Response System-1 (Pan-STARRS-1) in Hawaii announced the first-ever detection of an interstellar asteroid, named 1I/2017 U1 (aka. ‘Oumuamua). In the months that followed, multiple follow-up observations were conducted that allowed astronomers to get a better idea of its size and shape, while also revealing that it had the characteristics of both a comet and an asteroid. The study – “Could Solar Radiation Pressure Explain ‘Oumuamua’s Peculiar Acceleration?”, which recently appeared online – was conducted by Schmuel Bialy and Prof. Abraham Loeb. Whereas Bialy is a postdoctoral researcher at the CfA’s Institute for Theory and Computation (ITC), Prof. Loeb is the director of the ITC, the Frank B. Baird Jr. Professor of Science at Harvard University, and the head chair of the Breakthrough Starshot Advisory Committee. To recap, ‘Oumuamua was first spotted by the Pan-STARRS-1 survey 40 days after it made its closest pass to the Sun (on September 9th, 2017). At this point, it was about 0.25 AU from the Sun (one-quarter the distance between Earth and the Sun), and already on its way out of the Solar System. In that time, astronomers noted that it appeared to have a high density (indicative of a rocky and metallic composition) and that it was spinning rapidly. While it did not show any signs of outgassing as it passed close to our Sun (which would have indicated that it was a comet), a research team was able to obtain spectra that indicated that ‘Oumuamua was more icy than previously thought. Then, as it began to leave the Solar System, the Hubble Space Telescope snapped some final images of ‘Oumuamua that revealed some unexpected behavior. After examining the images, another international research team discovered that ‘Oumuamua had increased in velocity, rather than slowing down as expected. The most likely explanation, they claimed, was that ‘Oumuamua was venting material from its surface due to solar heating (aka. outgassing). The release of this material, which is consistent with how a comet behaves, would give ‘Oumuamua the steady push it needed to achieve this boost in velocity. To this, Dialy and Loeb offer a counter-explanation. If ‘Oumuamua were in fact a comet, why then did it not experience outgassing when it was closest to our Sun? In addition, they cite other research that showed that if outgassing were responsible for the acceleration, it would have also caused a rapid evolution in ‘Oumuamua’s spin (which was not observed). Based on this, Dialy and Loeb went about calculating the likely shape, thickness, and mass-to-area ratio that such an artificial object would have. They also attempted to determine whether this object would be able to survive in interstellar space, and whether or not it would be able to withstand the tensile stresses caused by rotation and tidal forces. What they found was that a sail that was only a fraction of a millimeter thick (0.3-0.9 mm) would be sufficient for a sheet of solid material to survive the journey through the entire galaxy – though this depends greatly on ‘Oumuamuam’s mass density (which is not well-contrained). Thick or thin, this sail would be able to withstand collisions with dust-grains and gas that permeate the interstellar medium, as well as centrifugal and tidal forces. As for what an extra-terrestrial light sail would be doing in our Solar System, Dialy and Loeb offer some possible explanations for that. First, they suggest that the probe may actually be a defunct sail floating under the influence of gravity and stellar radiation, similar to debris from ship wrecks floating in the ocean. This would help explain why Breakthrough Listen found no evidence of radio transmissions. Scientists and stargazers alike were transfixed last year when ‘Oumuamua, the first object known to come from outside our solar system, passed close by our sun. Astrophysicists had long believed it was possible for such objects to exist, but none had ever been observed before. But something strange happened. As ‘Oumuanua passed by the sun, it accelerated — speeding up in a way that we wouldn’t expect if it were simply being driven by the force of gravity. A new paper from Harvard astrophysicists Shmuel Bialy and Abraham Loeb offers a startling hypothesis: It could have been an alien artifact, an actual piece of technology from an interstellar civilization. This isn’t just baseless speculation, either. The authors of the paper started with a simple idea: What if pressure from the sun’s radiation caused the unexpected acceleration ‘Oumunanua exhibited? Seems reasonable enough. Thus, considering the object as a thin surface, we could imagine a conical or hollow cylindrical shape. “You can easily envision that by rotating a curved piece of paper and looking at its net surface area from different viewing angles,” Loeb told me. The researchers acknowledge that such an object could be the result of a natural process. However, they present another intriguing hypothesis. There’s another even more exciting possibility. The authors believe it would be highly unlikely for a random piece of space debris from an alien society to simply find its way into our solar system by chance unless the galaxy were completely littered with this junk. It’s not impossible, but they argue that previous calculations they’ve conducted suggest it’s more likely that, if ‘Oumuamua came from an alien civilization, it was sent on purpose. Under this hypothesis, “‘Oumuamua is a targeted probe on a reconnaissance mission and not a member of a random population of objects,” they write. However, this view was not entirely satisfying, either. As it passed through our solar system, ‘Oumauamua did not display any sign of having a comet-like tail, which would likely accompany an object accelerating because of gaseous jets. Frustratingly, it seems most likely we’ll never get a definitive answer about what ‘Oumuamua was. It has left our solar system, and it’s too distant to observe now. Even while it was nearby, our imaging technology could only capture hazy pictures of the object. So we’re still mostly in the dark. But if we could confirm that an alien object had visited our solar system, we’d finally have an answer to physicist Enrico Fermi‘s famed paradox. He asked: Given the assumption that humans were unlikely to be a unique occurrence in the universe, and given that eons have passed since life became possible in the universe, why haven’t we encountered any sign of alien life? Perhaps we already have — we just didn’t realize it at the time. Harvard researchers raise the possibility that it may be "a fully operational probe sent intentionally to Earth vicinity by an alien civilization." Now a pair of Harvard researchers are raising the possibility that Oumuamua is an alien spacecraft. As they say in a paper to be published Nov. 12 in The Astrophysical Journal Letters, the object "may be a fully operational probe sent intentionally to Earth vicinity by an alien civilization." The researchers aren't claiming outright that aliens sent Oumuamua. But after a careful mathematical analysis of the way the interstellar object sped up as it shot past the sun, they say Oumuamua could be a spacecraft pushed through space by light falling on its surface — or, as they put it in the paper, a "lightsail of artificial origin." "It is impossible to guess the purpose behind Oumuamua without more data," Avi Loeb, chairman of Harvard's astronomy department and a co-author of the paper, told NBC News MACH in an email. If Oumuamua is a lightsail, he added, one possibility is that it was floating in interstellar space when our solar system ran into it, "like a ship bumping into a buoy on the surface of the ocean." 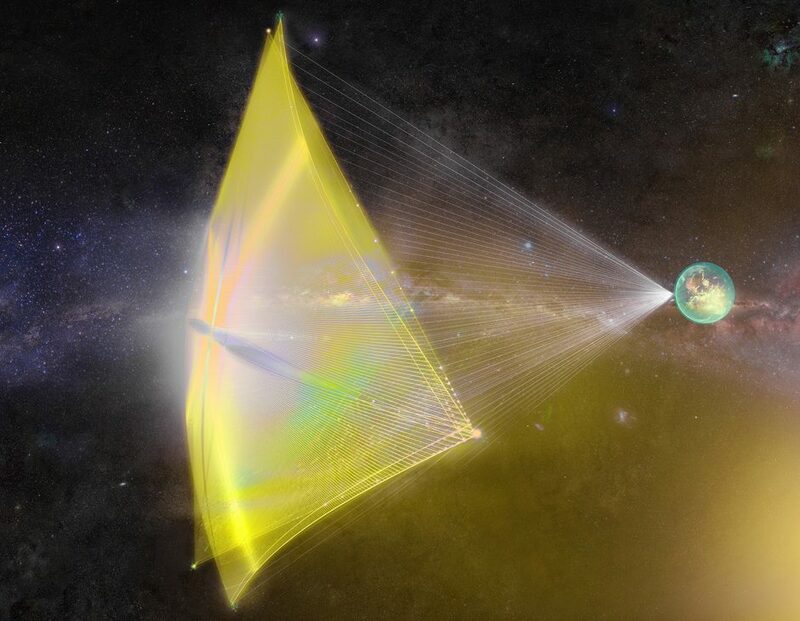 Earthlings have launched simple solar-powered lightsails of our own, and Loeb is an adviser to Breakthrough Starshot, an initiative that plans to send a fleet of tiny laser-powered lightsail craft to the nearest star system. But the technology is in its infancy — at least here on Earth. Loeb and his collaborator, Shmuel Bialy, a postdoctoral fellow at the Harvard-Smithsonian Center for Astrophysics, acknowledge that the alien spacecraft scenario is an "exotic" one. And perhaps not surprisingly, other space scientists have strong doubts about it. "It's certainly ingenious to show that an object the size of Oumuamua might be sent by aliens to another star system with nothing but a solar sail for power," Seth Shostak, a senior astronomer at the SETI Institute in Mountain View, California, said in an email. "But one should not blindly accept this clever hypothesis when there is also a mundane (and a priori more likely) explanation for Oumuamua — namely that it's a comet or asteroid from afar." Coryn Bailer-Jones, an astronomer at the Max Planck Institute for Astronomy in Heidelberg, Germany, voiced similar objections. "In science," he said in an email, "we must ask ourselves, "Where is the evidence?, not "Where is the lack of evidence so that I can fit in any hypothesis that I like?" Bailer-Jones, who earlier this year led a group of scientists who identified four dwarf stars as likely origin points for Oumuamua, raised questions in particular about the object's tumbling motion. "Why send a spacecraft which is doing this?" he said. "If it were a spacecraft, this tumbling would make it impossible to keep any instruments pointed at the Earth. Of course, one could now say it was an accident, or the aliens did this to deceive us. 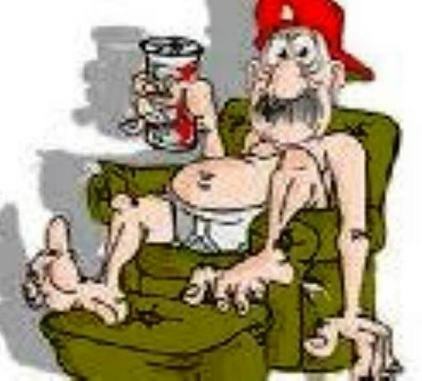 One can always come up with increasingly implausible suggestions that have no evidence in order to maintain an idea." But Loeb called the conjecture "purely scientific and evidence-based," adding, "I follow the maxim of Sherlock Holmes: When you have excluded the impossible, whatever remains, however improbable, must be the truth." The truth may be hard to establish, as Oumuamua has left the solar system and is no longer visible even with telescopes. In any case, Loeb said, the fact that we've observed one interstellar object like Oumuama suggests that others may be out there — and astronomers should begin a search for them. "A survey for lightsails as technosignatures [of extraterrestrial civilizations] in the solar system is warranted," he said, "irrespective of whether Oumuamua is one of them." The three spacecraft are SOHO, STEREO-A, and STEREO-B (the latter both part of the STEREO mission), and the way they work is quite ingenious. We know that gravity pulls objects together in proportion to their masses and relative distance. It is also easy to imagine that two massive objects will both pull on a very light object with some gravity. We can therefore expect there to be a point in space (moving along with the Earth as it orbits the Sun), where the pull from the Earth balances out the pull from the Sun. Because the Earth is about 333,000 times lighter than the Sun, this point is much closer to the former than it is to the latter. This point, 1,500,000 km away from the Earth (1/10th of the distance to the Sun) is where the SOHO spacecraft is positioned. We call it the first Lagrangian point (L1 for short) after Joseph-Louis Lagrange, the prolific 18th century mathematician and astronomer who discovered it and other points like it. This animation (annotated) shows the path of the interstellar asteroid 1I/2017 (`Oumuamua) through the Solar System. Observations with ESO's Very Large Telescope and others have shown that this unique object is dark, reddish in colour and highly elongated. The interstellar visitor made it respectable to talk about alien spaceships. Last year, an enigmatic object named Oumuamua startled astronomers when it came streaking past the sun, giving humanity its first close-up look at an object from beyond our solar system. This year, the interstellar visitor did something even more remarkable: It made it respectable to talk about alien spaceships. The turning point came in November, when Avi Loeb, the head of the astronomy department at Harvard University, co-wrote a paper saying that Oumuamua is so unusual that scientists should consider the possibility that it’s not a far-out comet or asteroid, as his colleagues assumed, but rather an artificial structure. In other words, maybe it’s an interstellar craft built by extraterrestrials. Some of Loeb’s colleagues were intrigued. Others were disconcerted. But suddenly mainstream scientists were talking about how to tell if Oumuamua is a natural object or — as Loeb raised as a possibility in his paper — an alien spacecraft designed to capture the force of sunlight (a so-called lightsail). Jason Wright, a Penn State astronomer who recently launched a graduate program in SETI (the search for extraterrestrial intelligence), shares Loeb’s desire for open discussion — and offers an upbeat assessment of the field’s growing respectability. “There’s a real culture change. SETI is becoming a serious scientific discipline,” he says. There were more surprises. Oumuamua was too far away for astronomers to observe its shape directly, but they could tell by the extreme way its brightness shifted as it tumbled through space that it wasn’t like any space rock they had ever seen. “It’s very elongated, with an axis ratio of at least 7 to 1,” astronomer Karen Meech of the University of Hawaii said in an email. In other words, it’s at least seven times as long as it is wide — shaped like a cigar, perhaps. Or, as Loeb proposes in his paper, maybe a flattened disk. Astronomers’ models predict that most of the small bodies wandering in interstellar space are comets. But when Meech and others examined it, Oumuamua showed no sign of the expected comet-like tail. It’s also quite small, on the order of 1,000 feet long, and it seems to be much more reflective than the comets we know. Intrigued by its oddities, several groups of SETI researchers listened for possible radio transmissions from Oumuamua — and heard nothing. Comets often accelerate that way when gases boil off their surface under heat from the sun. But observations by the Spitzer Space Telescope showed no such material coming off of Oumuamua. At this point, Loeb thought it was time to consider a more radical interpretation and, with a post-doctoral student, Shmuel Bialy, wrote the provocative paper. In it, the scientists consider the possibility that Oumuamua lacks a tail because it isn’t a comet at all, and that the acceleration was caused not by boiling gases but by the pressure of sunlight against a very wide, thin lightweight structure. Loeb anticipated a harsh reaction to his paper, and his expectation was soon fulfilled. Twitter buzzed with snide comments. “A new paper, which claims Oumuamua is an alien probe, is full of poop,” one skeptic tweeted. “The Loeb paper says WHAT IF ALIEN LIGHT SAILS? Occam says no,” tweeted another in a reference to Occam’s Razor (a philosophical principle that when there are two competing explanations for an occurrence, the simpler one is usually better). In his view, searching for evidence of alien artifacts is no more outrageous than physicists exploring higher dimensions or astronomers invoking dark matter to explain the motions of galaxies. Or, more to the point, no more outrageous than searching for microbes on Mars. “All I’m doing is following the standard scientific process, looking for explanations,” Loeb says. What’s different is that the stakes are so high. Finding evidence of an extraterrestrial civilization would be far more profound than finding extraterrestrial microbes. It would tell us that humans aren’t the only intelligent species around. Wright believes the excitement over Oumuamua, combined with the other recent developments in the field, is breathing new life into SETI research. “There’s a popular misperception that it’s just people listening for radio signals and coming up with one null result after another,” he says of SETI. He counters that there are actually a tremendous number of ways to search for alien life once scientists broaden their horizons. Wright has participated in studies of Tabby’s Star, whose intermittent dimming had some scientists wondering if it was encased within a vast artificial structure built by aliens. While the latest results show that’s not the case, Wright is undeterred. Almost all such searches are destined for failure, he says, and all it takes is one success to change the world. With that in mind, he advocates digging through existing astronomical data to look for other stars whose peculiar behavior could indicate the presence of alien construction projects. “There are many rich datasets sitting out there to look through,” he says. And what a surprise that would be. The discovery of ‘Oumuamua continues to prove itself one of the most fascinating and mysterious astronomy stories of our time. It all began in October 2017 when astronomers using the Pan-STARRS telescope in Hawaii spotted a strange object passing through our Solar System at a high velocity. The object defied classification and still does, and its origin remains unknown. What is known is that it originated from somewhere outside of our Solar System, making it the first known interstellar object to visit our neck of the cosmic woods. The path ‘Oumuamua took through the Solar System. Almost immediately after its discovery, ‘Oumuamua’s odd behavior and characteristics caused many to speculate that it could be an alien craft or probe sent to explore our Solar System. That speculation grew stronger in November 2018 when astronomers Shmuel Bialy and Avi Loeb of the Harvard Smithsonian Center for Astrophysics published a study arguing that ‘Oumuamua’s anomalous acceleration and direction could mean the object isn’t a comet or asteroid, but instead an artificial craft or probe propelled by a “light-sail,” meaning it uses the ‘winds’ of solar radiation to propel it through space. Of course, those claims attracted controversy, criticism, and outright jeers in some cases. How could two of the most respected astrophysicists in the country claim any possibility that an anomalous object in space could be artificial? How dare they! Don’t they know that science is supposed to suppress the imagination as opposed to ignite it? In response to the controversy, one of the paper’s authors sat down for an interview with Israeli news outlet Haaretz to discuss ‘Oumuamua and the resistance to acknowledge any possibility that ‘Oumuamua could be from an extraterrestrial civilization. I don’t care what people say. It doesn’t matter to me. I say what I think, and if the broad public takes an interest in what I say, that’s a welcome result as far as I’m concerned, but an indirect result. Science isn’t like politics: It is not based on popularity polls. ‘Oumuamua (dot in center) as seen by the Pan-STARRS telescope. If you’re not ready to find exceptional things, you won’t discover them. Of course, every argument needs to be based on evidence, but if the evidence points to an anomaly, we need to talk about an anomaly. Who cares if this anomaly appeared or did not appear in science-fiction books? The whole interview is worth a read for anyone interested in astronomy or the search for alien life. In it, Loeb lays out his entire argument for why we must be open to the possibility that ‘Oumuamua is a spacecraft or probe. It’s important to note that Loeb never comes out saying definitively that ‘Oumuamua is an alien craft, only that we must be open to the possibility that it could be based on the available evidence. Still, science has a long history of persecuting those who go against the paradigm or challenge popular opinions. Will Loeb be remembered in the future as a rebellious hero like Galileo, or a crank suffering from wishful thinking? In 2017, scientists spotted a gigantic rocky object, about the size and shape of a skyscraper, hurtling through our solar system. And they soon discovered that this terrific space rock didn't originate within the eight-planet system we call home. Instead, it comes from another solar system. The scientists, who saw the rock through the University of Hawaii's Pan-STARRS1 telescope, called it 'Oumuamua, which means "a messenger from afar arriving first." "Space's Deepest Secrets" is back this evening with a deep dive into 'Oumuamua. While 'Oumuamua has been briefly classified as both an asteroid and a comet, according to NASA, the show promises to "investigate the mystery of an ancient asteroid" and detail the high-energy race to discover as much as we can about this mysterious rock before it leaves our solar system. NASA observations suggest that the rocky object (the organization uses "object" since there isn't enough evidence to define it as either an asteroid or a comet) wandered through the Milky Way for hundreds of millions of years before encountering our solar system. In January 2019, it moved beyond Saturn's orbit. Since 'Oumuamua was a complete unknown when it was discovered in 2017 — the first true alien object, according to one of the astronomers in a new promo for "Space's Deepest Secrets" — scientists are eager to learn more and "unlock its secrets." The show promises to answer: "How did 'Oumuamua get here? Does it pose a threat to the Earth? Could it even be an alien spaceship?" To address one question: NASA's space telescopes have tracked 'Oumuamua traveling about 85,700 mph (23.8 miles per second, or 38.3 km/s) relative to the sun. At that speed, the episode states, it could destroy whole cities if it were to hit Earth (which it luckily seems like it won't do in our lifetime, given that it's heading out of our solar system). As to whether it's really a spaceship in disguise, you'll have to tune in to see. But the origin and purpose of a skyscraperesque rock is only the start of the mysteries "Space's Deepest Secrets" will unravel this season. Coming up, according to a statement from the Science Channel, the show plans to tackle the awesome power of mega storms on Jupiter, Saturn, Uranus and Neptune; the existence of enormous black holes that can rip planets and stars apart; and "evidence of an ancient solar system that could rewrite the story of our cosmic roots."